"The disciplines of hardware and software engineering have always been intertwined and symbiotic - like the yin and yang of some bizarre abstract beast. Software cannot exist without hardware to execute it, of course, and most hardware today is designed in the service of software. The vast majority of systems being designed today involve a mix of both elements working together, with software steadily inheriting more and more of the complexity load. 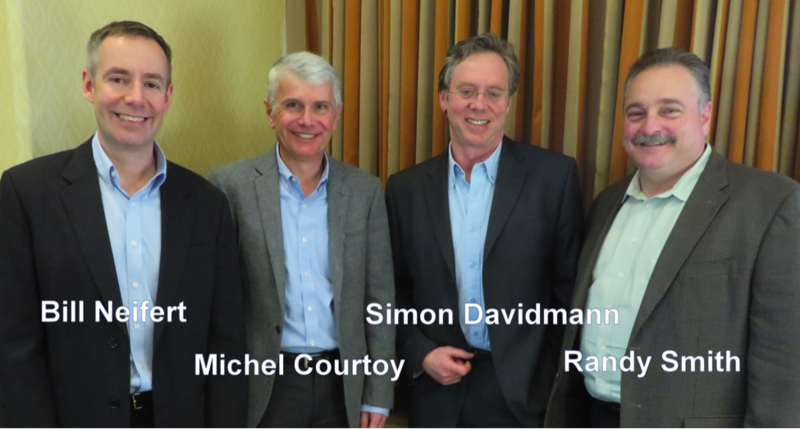 Let’s think about that for a minute..."
At the DVCon conference in Santa Clara in April, Brian Bailey of Semiconductor Engineering hosted a round table discussion on the state of EDA and the opportunities for new startups to grow and succeed. Imperas CEO and OVP founder, Simon Davidmann was part of the discussion. Other participants were Bill Neifert, chief technology officer at Carbon Design Systems; Randy Smith, vice president of marketing for Sonics; and Michel Courtoy, vice president of marketing and business development for Kilopass Technology. The discussion is being reported in 3 posts by Brian. There are links to them below. Recently Electronic Engineering Journal (EEJournal)'s Jim Turley wrote an interesting article on Imperas and the view that Imperas takes regarding software development. "... Imperas thinks that programmers, as a class and as a profession, could stand to learn a few hard lessons from their colleagues over on the hardware side of the house. Specifically, the SoC and ASIC designers. Now those guys have got their stuff together. You could learn a few things from them. So what do the hardware guys do that the software people don’t? They simulate, mostly. They simulate the..."
"... The idea is that you simulate your code running on a simulated processor with simulated peripherals and simulated APIs. Everything runs on a standard x86-based PC; the more CPU cores it has, the better. Imperas’s tools will translate your ARM, MIPS, or other binaries to x86 on the fly for simulation. As part of that translation, the tools also..."
Read the full article is available on the EEJournal website here. To read the blog, please visit the Imagination Blog Site. Comments on Imperas Software, Green Hills Software announcments about how their support with models and tools boost Imagaination's MIPS architecture and move its ecosystem forward. With the run up to the Embedded World conference and exhibition in Germany in February, Larry Lapides of Imperas contributed a guest blog for Imagination on the latest OVP Fast Processor models for the new MIPS Warrior range. The blog talks about several items related to Imperas, OVP and Imagination's MIPS models. It also provides the outline for the Embedded World paper on accelerating simulation using multi-core host PCs and also provides links to other related topics. John Cooley, though focused on the EDA simulation, synthesis, and RTL areas collected some information regarding the recent acquisitions.